Have you heard of Eclipse, Seattle’s bus riding dog? 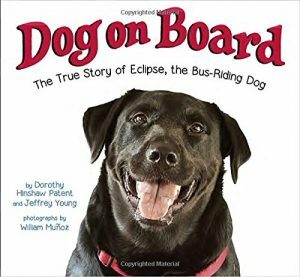 Dog on Board, tells her story. Take a look for book details, and watch the video, from Seattle’s KOMO TV, and this one, from the King County Department of Transportation. You’ll fall in love with Eclipse, just as I did when I met her. I join Eclipse as we ride to her favorite place, the dog park. 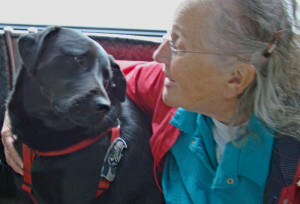 Eclipse knows where to get on the bus and where to get off, all by herself, with no help from her proud human companion, Jeff. 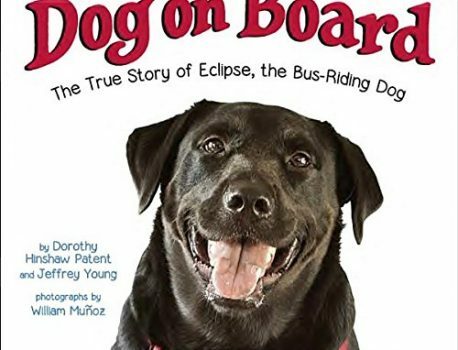 Eclipse loves going to the dog park to play ball with Jeff and to visit her friends, so if he gets distracted when the bus arrives, Eclipse can just hop on board, get off at the park, and greet her canine friends while she waits for Jeff to catch up. 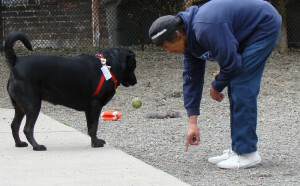 Jeff lets Eclipse know she needs to drop the ball so he can throw it again for her. Because Eclipse has become famous, Jeff now makes sure she doesn’t get ahead of him, so they always travel together now, or another friend takes over. Once they are at the park, Eclipse is eager to play ball, but she has to drop it for Jeff first! Greg and Jeff chat as we stroll through Seattle. She also likes to explore her hometown, visiting her favorite sites such as the store, Mud Bay, where she always gets a treat, or Pike Place Market, where she can sniff out treats from the stores. 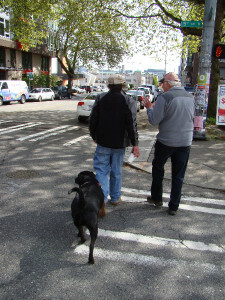 Between stops, Jeff, Eclipse, my husband Greg and I, strolled along Seattle’s streets exploring this delightful city.